Baltimore’s Heartbreak: Where did the fury come from? Forty-seven years ago, when the city of Baltimore had its most catastrophic riot in the aftermath of Dr. Martin Luther King’s assassination, City Hall quickly imposed a curfew. I was a young reporter for the Baltimore News-American, fresh out of college, and stood in the rubble around Eager and Ensor streets in East Baltimore as city police stopped one teenager after another, and the same dialogue was repeated scores of times. Same Cop: “Where are you coming from? When the newest catastrophic riot broke out Monday afternoon, it was started by the children of the children of 1968’s riot, who are still wandering between the overmatched mother and the absent father, still wandering between the overmatched school teacher and the broken neighborhood where street corners are controlled by the heroin dealers, and they arrived at the Mondawmin Mall directly across from Frederick Douglass High School and commenced attacking police, attacking cars and stores, and they looted and set fires, and there is no one out there who can legitimately connect such madness with any tribute to the deceased Freddie Gray. Forty-seven years after riots were supposed to signal a new American agenda for cities, and for race relations, and for some semblance of economic fairness, the torch has been passed to a new generation of the furious. But what motivates the fury now? 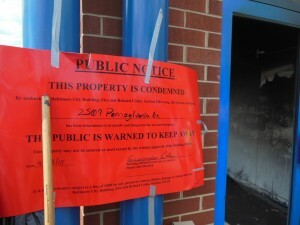 Nominally, the death of the 25-year old Gray sets off the newest trouble. He arrives out of West Baltimore stereotype: more than a dozen arrests, a few convictions, a history involving drugs. And, as The Washington Post reports, a pitiful school record, a childhood home with severe lead paint problems, and a disabled mother addicted to heroin. Then comes that afternoon when Gray runs from police, who arrest him for reasons still not easily discernible. And he dies from severe spinal injury, while in police custody, which no one has explained. The outrage against police should be understandable to all. But the antagonism between the cops – black and white – and African-American citizens goes back generations, to a time before citizens carried video cameras that give legitimacy to claims of police abuse. Behind him, scores of hands reached into the air. Now go back across more than 40 years, to countless courtrooms around Baltimore packed with spectators, where you watched the same Murphy as he legendarily cross-examined city police who’d arrested clients of his over dubious charges. The cops fell all over themselves, tongue-tied and sweaty and disheveled as they tried to get their stories straight. Murphy caught them in one lie after another. These confrontations became part of Baltimore legal folklore. So the anger toward police doesn’t come merely from Freddie Gray, but from generations of mutual suspicion and antagonism. 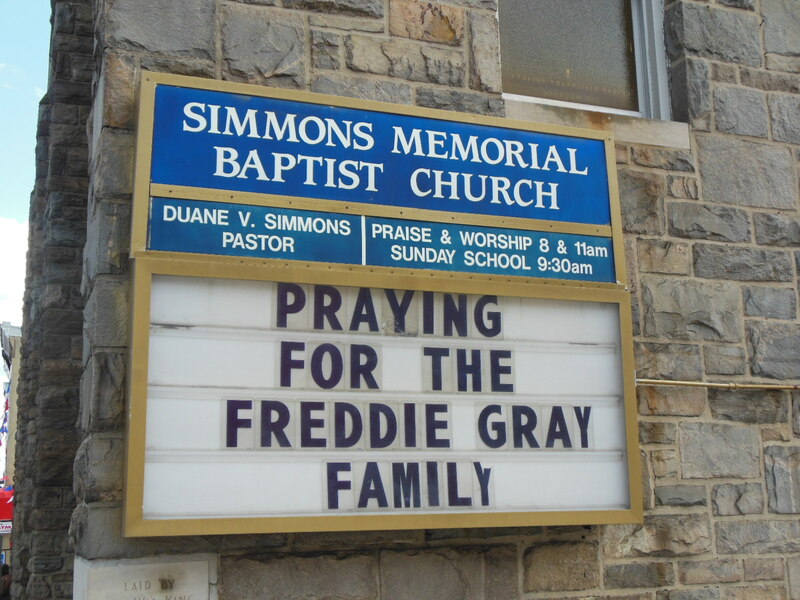 But trashing your own neighborhood, and your own city, pays no tribute to Gray. “An embarrassment,” Police Commissioner Anthony Batts called the rioting. 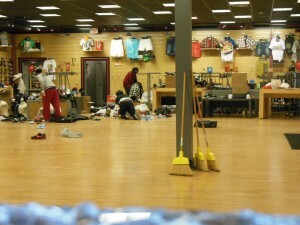 He mentioned a mother who found her teenage son amid the rioters Monday afternoon “and smacked him around. Which “beautiful” city does she mean – for we live in more than one. There’s the city of great promise, where people with a few bucks live the good life and wish to put down roots – and there’s the city of the permanent poor, much of it African-American, where all day the many jobless sit on front stoops, and the young go to schools with outdated textbooks, and the kids are bright enough to figure things out pretty quickly: the deck has been stacked against them. To whom should they say it? These kids aren’t listening to authority figures any more. They learn, from the start, that they’re pretty much on their own. The mother goes off to work, and comes home exhausted. The father disappears for months at a time, or years. The kids live in a nation where moral values, and political fortunes, are reduced to a word – money – and they know they’ve been systematically excluded from that world. 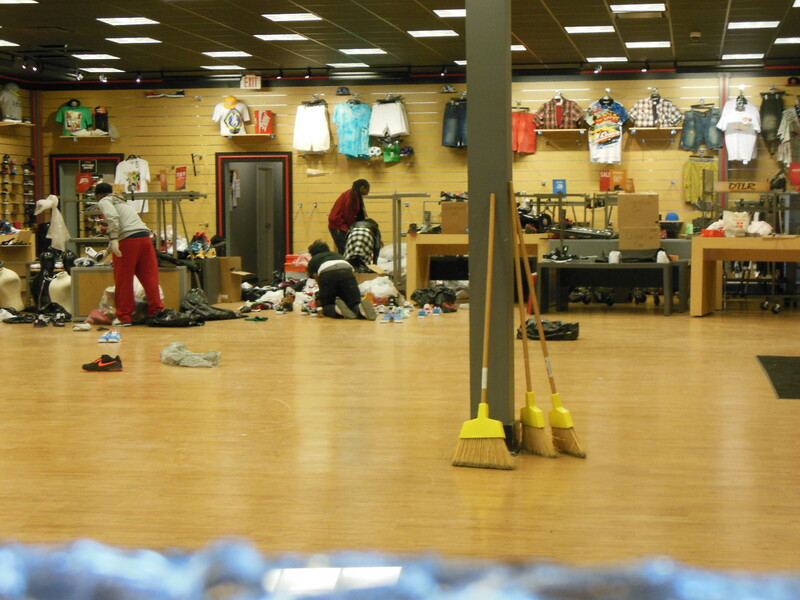 On Monday the rioting spread from Mondawmin Mall to North and Pennsylvania avenues, and there it went beyond rocks and bricks to those breaking into a CVS drug store, and looting it and setting it afire. Wonderful. It took decades after the ’68 riots for business people to take the risk of investing in such neighborhoods. And now it will take years more for them to take another chance. And, until they do, where will West Baltimoreans go for the simple prescription for a sick child? Some of us are lucky this week. We weren’t caught in Monday’s madness but watched it from the safety of our living rooms. But this involved its own peril. Young’s heart was in the right place, but not his language. There’s not much space for “positive” coverage in the midst of so much destruction and heartache. But there was too much coverage that probably made matters worse. In the earliest manifestations of anger over Freddie Gray, we had CNN’s Jake Tapper outside Western District, predicting “hundreds, if not thousands of people” taking to the streets. But it was 4 o’clock in the afternoon – and those streets were utterly empty. Tapper threw it to another reporter, and then another, each of them at a different location and each predicting big crowds – and each standing there on an empty street. They were an inch shy of declaring, “Come on down, folks, and we’ll put you on television. Later that day, as a crowd gathered outside Western District, police arrested two men – one for throwing a bottle. “We have a major confrontation,” cried an agitated Erin Burnett on that same CNN. And her network would bring it to us, she said, right after these commercials. Well, if that’s a “major confrontation,” then what were the ’68 riots, when the city suffered through more than a thousand arson fires of homes and businesses, and nearly 5,000 people were arrested over four nightmare days and nights, and hundreds of people were injured and six killed? A little perspective, please. History goes back a little further than the latest commercial break. As heartbreaking as the riots of 2015 have been, they don’t compare with 1968. It’s just that, 47 years later, we thought things would be so much better. We thought the gap between haves and have-nots would narrow, instead of mushrooming to the greatest distance in history. We thought children would grow up in an America that held out equal promise – no matter their skin color. 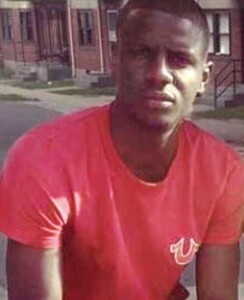 We thought we wouldn’t have the death of someone like poor Freddie Gray used as an excuse for rioting – when hundreds of young black men in this city are murdered each year, and this is taken for granted. We thought parents would enforce discipline on their children – so we wouldn’t have to turn it over to the police. Which is where we find ourselves, 47 years later. Dear Michael, thank you for your thoughtful and heartfelt post. As someone of a similar generation, but a Brit, I’m devastated by what I see happening in the US, and the terrible, overt racism: a people abandoned. I began visiting the States 30 years ago, and was shocked to see the apartheid of poverty. In Chicago, African Americans sat huddled in blankets beneath the Loop, begging; cab drivers slept in their cars, because they couldn’t afford to rent anywhere (or fix their car); arriving at airports, i’d see young African-Americans spreadeagled over their car hoods, while being searched by local police. In restaurants in a mixed neighbourhood in Washington DC, a burly white man asked me to take a photo of him and his father, because I was the only other white person there. In Harlem, where I stayed for a week on ’09, I was appalled that many churches were closed when there were homeless and hungry on many street corners. When I looked and listened, I kept reminding myself that Africans are my HEROES. Mankind was born in east Africa – the skeletons of Lucy and her ancestor were found in the Afar region of Ethiopia, millennia before we began migrating across the world. As a homesick new arrival in Ethiopia in 1962, local people made me feel very welcome and cherished; ‘poor’ people shared meals and all nationalities did well, as long as they worked hard. Emperor Haile Selassie was a leading light in Africa then, and Ethiopia was the first African country to join the League of Nations. JF Kennedy opened a library in his name in Addis Ababa in 1963. I revered Mandela and Tutu and am lucky enough to have heard them both speak. So, that is how I feel about the huge potential that African Americans have, if only we’d encourage them. Look at your football, look at baseball and athletics. Where would the US be in the Olympics without those awesome athletes? Look at Martin Luther King; look at jazz, soul, hip-hop, Stevie Wonder, Pharrel Williams, Beyonce, Jay Z? Not sure how to make this happen. 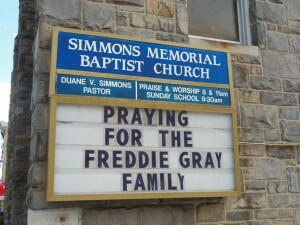 I do have relatives in Baltimore – cousins – Greg and Kimberly Clark, whose mom was my mother’s sister. They’re half Norwegian like me, so perhaps by helping a young African American, I can complete the family tree for me my relatives in Norway. I know my long-passed mom would love that – her sister died far too young, and both were very caring women. Hope you can help me to help in a small way, Michael…… (This is a genuine offer.) May many more peacemakers appear in the coming days….